Arnold Schwarzenegger has had a miraculous career. He started his ascent into popular culture by being a body builder and winning the Mister Universe competition. This turned into a cinema career that encompassed both comedy and action. He was the star of The Terminator series, Twins, Total Recall and True Lies, to name but a few of his credits. Then he took on politics and became the governor of California. Now that his term in the state house is over, Arnold is back to what he does best – films. His comeback feature is The Last Stand. The story is of (wait for it) a last stand. Arnold Schwarzenegger plays Sheriff Ray Owens, the lawman in a small Arizona town of Sommerton Junction, just a stone’s throw from the Mexico border. From the first frame, one gets the feeling that this sheriff has seen more than most enforcers and just wants to live a simple life. His deputies seem to have little to do other than arrest drunks and practice shooting. The biggest threat to the public safety is from local gun nut Lewis (Johnny Knoxville), a man who runs his own weapons museum. Everyone knows where this is going. On the other side of the plot, a brazen escape happens in Las Vegas. Cortez (Eduardo Noriega) is a world-renown drug king pin who makes a daring fleeing with a federal agent as his hostage. The bad guy is also a former world-class race car driver. His minions steal for him a Corvette C6 ZR1 with a super charged motor. He is making his run for the border in a car that can do over 200 mph. The FBI has lost their man (or in this case woman) and they want them back. John Bannister (Forest Whitaker) is the agent in charge of the operation. He believes that Cortez will make a break at the border crossing but he notifies Sheriff Owens just as a longshot precaution. The Sheriff notices that something is just not right in his little town and begins an investigation. He soon finds that there is group of heavily armed men doing something at a local farm that butts up against the Mexico border. He puts two and two together and realized that Cortez is going to try to get to freedom by going through his town. He and the few people left in town decide to make a barricade and stop the bad guys from going through. There are few surprises in The Last Stand. When a local throws the keys of his super charged Chevy to Arnold, everyone knows we’ll see it in Act III. Within a few minutes, the audience sees the armory of Lewis and expects it to be a part of the ending. This is action filmmaking at its most basic level. Director Jee-Woon Kim (or Kim Jee-Woon because it is listed different ways on different internet sites) seems to know his action history. This film feels like it is from a by-gone era, those action-packed thrill-fests from decades past. The bad guys are just bad and more fodder for our hero to rein in. There is a certain sense of style in his camera work but it is much more of a retro feel to the proceedings. To put it simply, people die and stuff blows up real good. Yes, Arnold isn’t the man he was in Conan the Barbarian but he still cuts a heroic presence. Here he makes more than one reference that’s he old but he can still run rough with the best of them. This is a first step back into the limelight of Hollywood and a safe bet to revive his fan base. He won’t win many new converts with The Last Stand but he will remind some people why he was the biggest star on the planet at one time. Forest Whitaker plays the FBI guy just like everybody else plays an FBI guy. There is nothing special in his reading of the role. One expects more from this heavily-awarded performer. Johnny Knoxville is beginning to prove that he can be more than a Jackass — a crazed stunt-performer with a crazier group of friends. While his Lewis character isn’t too far removed from what he as done on television and docu-films, it does involve some acting. He just looks to be having the time of his life shooting guns at bad guys. 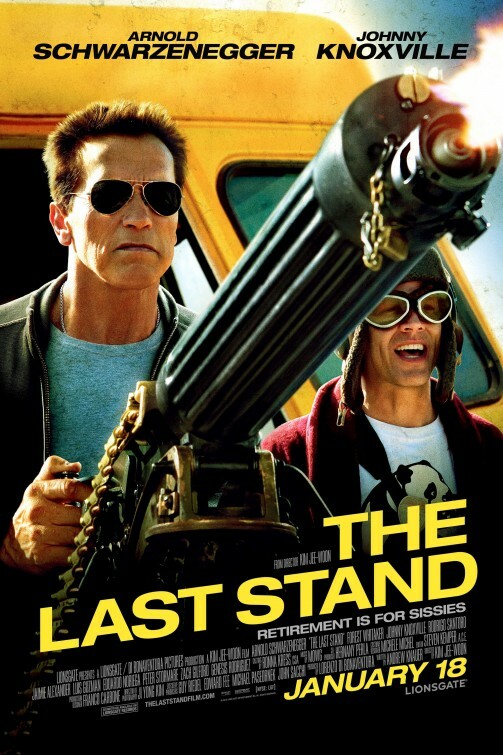 The Last Stand is not going to win any awards or make any ‘best of 2013’ lists. At best it is a check your brain at the door, Id entertainment; easily forgotten by Valentine’s Day. It will remind people of some of those flicks one catches on TBS or FX late at night.